The adjective referred to Crennan's location, in the Australian state of Victoria, for which Melbourne is the capital. 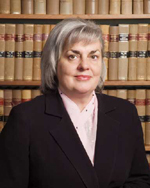 At the time Crennan (prior IntLawGrrls posts) was a judge on the Federal Court of Australia. Appointed Queen's Counsel in 1989, she'd also served inter alia as President of the Australian Bar Association and as a Commissioner for Human Rights. The only other woman ever to have served, from 1987 to 2003, had been Mary Genevieve Gaudron. Today 3 women serve on the country's High Court – Crennan, Susan Mary Kiefel, and Virginia Margaret Bell.